Newly released government data suggest that the Affordable Care Act is dragging down private sector hiring. Though the Act is projected by the Congressional Budget Office to cost nearly $1.5 trillion over the coming decade, it is important to keep in mind that the Act’s most serious costs might be found not in its price-tag, but in its labor market effects. Yesterday’s Job Openings and Labor Turnover Survey (JOLTS) data from the Department of Labor show that were 4.8 million job openings at the end of August—the highest level since January 2001. Related: Why Hasn't the Unemployment Rate Fallen in Half the States? Yet people are unwilling or unavailable to take these jobs. 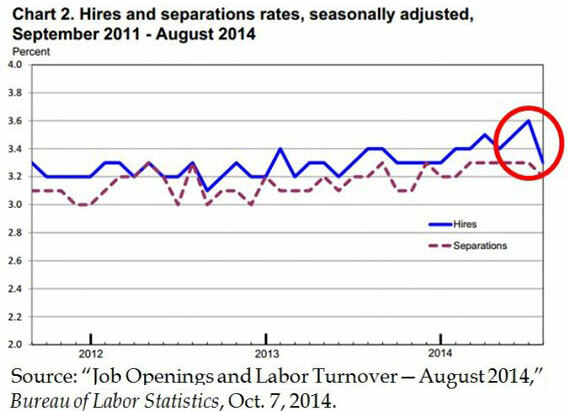 Hiring declined, with 300,000 fewer hires in August than in July (see circled parts of the graphs below). Opposite movements on this scale are rare and suggest underlying problems with the labor market. The increase in job openings was driven by opportunities in the private sector, as was the decline in hiring. 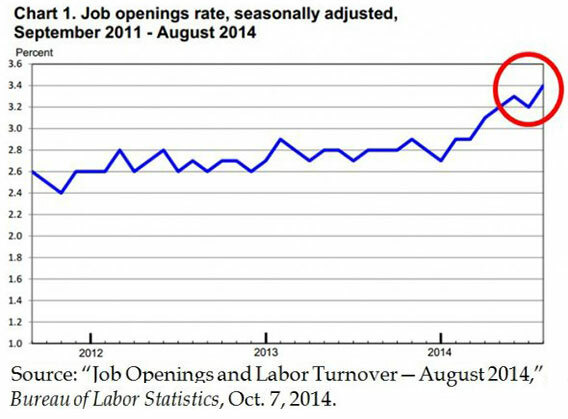 Public sector job openings and hires were flat. These data show that businesses are hesitant to fill their job openings—or workers are hesitant to take them. With uncertainty surrounding the Affordable Care Act’s employer mandate looming large for employers, it is no surprise that hiring rates are failing to pick up. Businesses with over 49 full-time equivalent employees were originally supposed to offer insurance plans that met broad government requirements by January 1, 2014. Now, because of delays made by the administration, employers with over 100 employees must provide healthcare coverage to at least 70 percent of their workforce or face fines of $2,000 per worker after January 1, 2015. In reality, this penalty is over $3,000 since it is not tax deductible. Growing from 49 to 50 workers will cost a business $60,000 in penalties once the mandate goes into effect for smaller companies on January 1, 2016, as the first 30 workers will be exempt. The delays did little to calm businesses worried about the costs associated with growing. Successful businesses plan for years down the road—not just for the next election. This same prohibition does not apply to part-time workers. Additionally, subsidies decline as incomes approach 400 percent of the federal poverty line ($47,000 for individuals and $95,000 for a family of 4), and they completely drop off for incomes that exceed these thresholds. Again, less work translates into more subsidies. Previous work from Mulligan has shown that under the Affordable Care Act’s penalties and prohibitions, up to 11 million low- and middle-income Americans could end up losing money by leaving unemployment or working more hours. This means the U.S. labor force participation rate will likely continue to fall, and it already stands at 62.7 percent. That is a level not seen since 1978. Mulligan also found that the economic waste from the Affordable Care Act, stemming from businesses trying to avoid paying the penalties by shifting their workforce compositions to more part-time workers, leads to an overall productivity decrease of one percent. The penalties reduce per capita output by two percent—hardly something Americans can afford after years of subpar economic growth. The only ways for the economy to grow are for people to work longer or to be more productive. The Affordable Care Act has negative effects on both of these inputs. Increasing access to health care, not creating major disruptions to the labor market, was the original purpose of the Affordable Care Act. However, because of the common-sense notion that losing benefits by working is equivalent to a tax on work, the negative employment effects should have been clear to policymakers. These negative effects are highlighted by the new labor turnover data from the Bureau of Labor Statistics. Jared Meyer is a policy analyst at Economics21 at the Manhattan Institute for Policy Research, where this article originally appeared. Where’s the Birthday Party for Healthcare.gov?